Provide precise protect for your iWatch! Lightweight but strong! 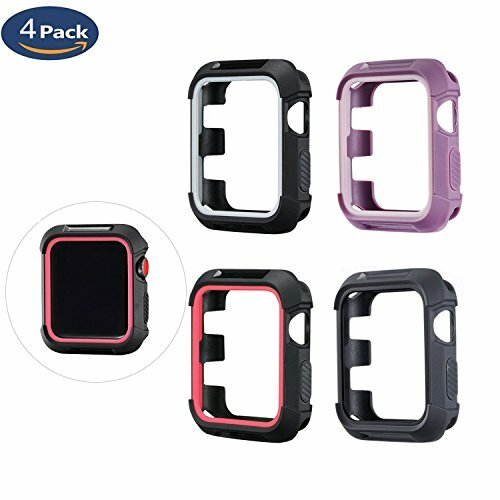 This rugged apple watch bumper case combines solid polycarbonate with flexible tpu materials seamlessly. Shell with raised area protects your watch away from touching in collision so as to keep it in safety. Just plug your apple watch in, the case will provide precise protect for your iWatch, especially in sports and outdoor activities. Furthermore, here are so many colors for choosing. Black, beige, purple, navy, dark grey, blue and so on. This product is sold exclusively by MAIRUIJIA. Only buy from MAIRUIJIA to get genuine MAIRUI products with Quality warranty and super customer service. MAIRUI is registered trademark of MAIRUIJIA and is exclusively distributed by MAIRUIJIA on Amazon. MAIRUI trademark is protected by US Trademark Law. Universal Compatibility-The rugged apple watch bumper case perfectly works with apple watch series 3 2 1, iwatch Sport/Edition/Nike+. Superior Quality-Protection for your watch screen, shock-proof and shatter-resistant screen protector case. The rugged protective bumper case dual layers combined of polycarbonate hard shell and flexible tpu materials prevents accidental drop, bump and shock. Easy installation-Plug your apple watch in and the protective bumper cover will protect your watch well. Easy to put it on and off. Access to all controls, buttons, sensors and Apple watch features. Comfy Experience-Lightweight but strong. Provides comfy in exercise, travel and outdoor activities. View More In Smart Watch Screen Protectors. If you have any questions about this product by MAIRUI, contact us by completing and submitting the form below. If you are looking for a specif part number, please include it with your message.